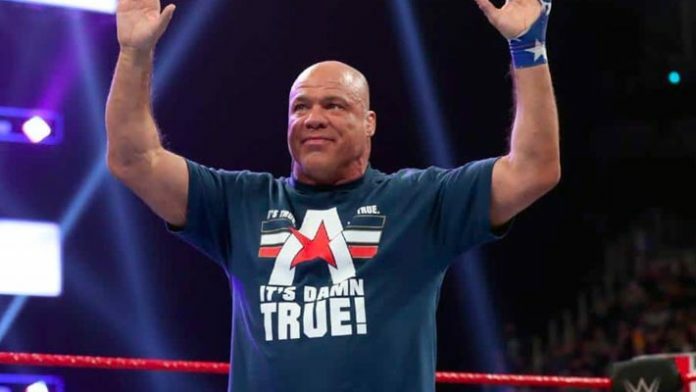 Kurt Angle has seen everything and probably done even more during his professional wrestling career but he is finally ready to call it a career. At WrestleMania 35, Angle will compete in his retirement match against Baron Corbin following an athletic career that stretches back more than 40 years. “We’re heading to WrestleMania next month and I will have my retirement match. 50 years old, I’m ready to hang it up and I’m going to have my last match at WrestleMania,” Angle said when making an appearance at the NCAA Wrestling Championships in his native Pittsburgh this weekend. Angle has been involved in professional wrestling in one form or fashion since first making his debut back in 1998. Just after winning the Olympic gold medal in freestyle wrestling in 1996, Angle was immediately pursued by WWE to join the promotion but he scoffed at the idea of transitioning to professional wrestling. It took a couple of years of convincing but Angle eventually came around, tried out for the WWE and eventually became one of the company’s biggest superstars. In recent years, Angle has gotten back into the ring despite lingering injuries that put him on the sidelines while once again working with WWE as the ‘general manager’ of Monday Night Raw. While he’s been more active in recent months, Angle finally decided that it was time to retire from active competition with one last match at WrestleMania in April. “I had a great career. 20 years, I enjoyed every minute of it, I also enjoyed [wrestling] so I’ve been very blessed,” Angle said. “Win 13 world titles in professional wrestling and obviously I’ve won six National Titles and an Olympic gold medal and a World Championship in amateur wrestling. So I’ve been very blessed.